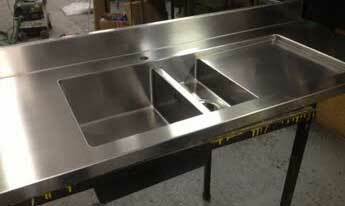 Hobbs & Porter manufacture bespoke stainless steel fully welded sink drainers with integrated upstands for domestic and commercial kitchens in the UK. Image taken during the fabrication process of stainless steel, fully welded and integrated sink drainer with 100mm upstand to the rear, with one and a half sink bowls, manufactured from 2mm thick grade 304 stainless steel. Overall thickness of front edge is 40mm. 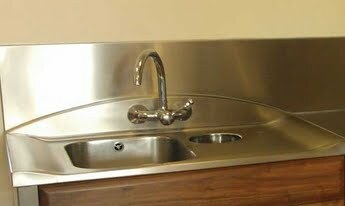 Fully welded bespoke stainless steel sink with curved drainers and curved integral upstand with one and a half bowl sink bowls with matching worktops and 400mm high splashbacks.